Rolling bearings are precision bearings, such as balls or rollers, which carry loads in a variety of applications with relatively little resistance. They are durable in even the toughest conditions and maintain a long service life; this can be projected as a period of time or a total number of rotations depending on the application. Over 99% of rolling bearings reach their expected service life. In fact, most causes of premature failure, such as rust, corrosion, pitting, and skewing, are preventable. To protect rolling bearings from long-term damage and premature failure, you can cover the sliding contact surfaces with a thin film of lubrication that separates the rollers and raceways. Engineers typically use grease to lubricate bearings because it is easy to handle and offers protective sealing capabilities for the system. Another lubrication option is oil, which flows freely and carries away heat, making it suitable for high speed or high temperature operations. 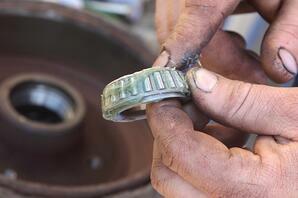 Just as normal rolling bearings have an expected service life, grease does as well. Engineers must consider this factor and diligently reapply lubrication to sustain proper bearing function. When done effectively, lubrication enhances bearing reliability and increases overall service life. • Selecting the wrong lubricant type - Grease and oil each have their own advantages and disadvantages, depending on the specific application. • Using too much or too little grease/oil – Too much grease can cause bearing temperature to rise, especially when operating at high speeds, while too little grease results in harmful metal-to-metal contact. • Mixing grease and oil – Each type of lubricant provides different benefits, but they should always be used separately. • Contaminating the grease/oil with objects or water – The lubricant’s primary function should be to seal the contact surface and prevent the entrance of media or water. Emerson Bearing has had “Bearings on the Brain” for over 50 years. Whether you’re looking for a hard-to-find bearing or need help selecting the right type of lubricant for your system, our team of specialists will examine your application and make an expert recommendation. For more information about the vital elements of rolling bearings, we invite you to download our eBook The Art of Precision Bearings.